This page is half presentation, half semi-coherent conversation with myself as I work through the problem of passive sonar, going from theory to implementation. Let's suppose we have a pair of audio transducers aka microphones. They are setup as below (m1 for microphone 1). Let's call the distance they are apart ds. 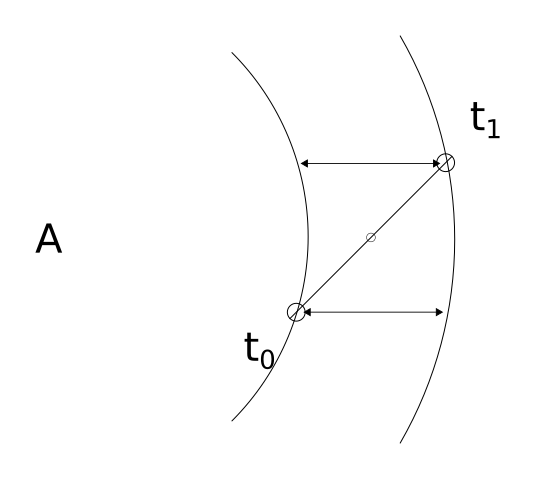 If this pair of microphones are perpendicular at their midpoint to a sound source (`A`), they will both hear/observe the sound source at the same moment. That is to say, if we noted the time when each microphone heard `A`, the difference in time would be `0`. The curve represents the leading edge of the pressure wave (sound wave) emitted by sound source A. t0 represents the time in which the first microphone hears the sound and t1 represents the time when the second microphone hears the sound. 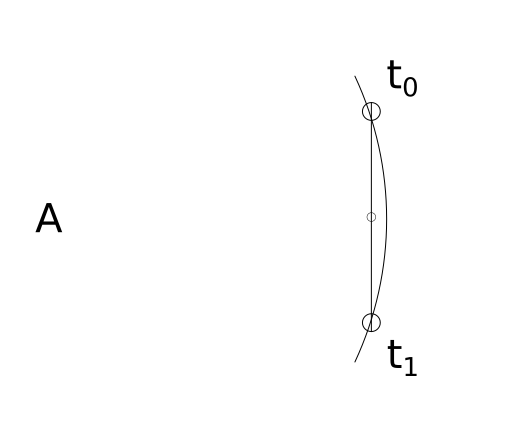 If t1 - t0 = 0, the line formed between the sound source and the midpoint must be perpendicular to the line formed by the two microphones. 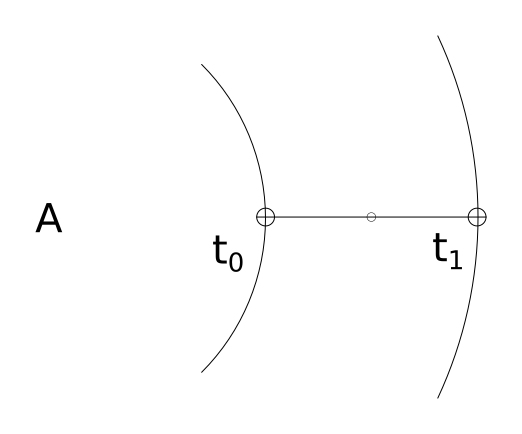 Suppose the pair of microphones have their midpoint (as well as themselves) colinear with sound source `A` as in the diagram below. The distance between the two microphones is known. That distance we have previously defined as ds. But this distance could also be determined by multiplying the time difference by the speed of sound1). The key takeaway is that the time difference observed by the microphones gives the distance the sound wave traveled between the first microphone and the second microphone. if the distance traveled by the sound wave between m1 and m2 is equal to ds, the distance of the microphones themselves, we know the sound source is colinear (at 0°) to microphones and their midpoint. Because the distance the wave travels clearly varies relative to its angle from the midpoint, we know there must be some calculation to determine this angle. Again, the distance the wave travels between m1 and m2 is determined by the time difference in observation. This distance is represented on the below diagram via the two lines with arrows. We can use this information to draw a triangle. The hypotenuse of the triangle is ds, the known distance between our microphones. The bottom leg is the distance determined via (t1 - t0)*Ss. Because the bottom leg of our triangle is parallel to the line going from the micropone midpoint to the sound source, the bottom left angle denoted by θ must be the same angle that is formed between the line connecting the microphones and the line connecting the midpoint to the sound source. See the below diagram. θ can be determine with a little trigonometry. Since cos(θ) = adjacent/hypotenuse, we know that θ = arccos(adjacent/hypotenuse). 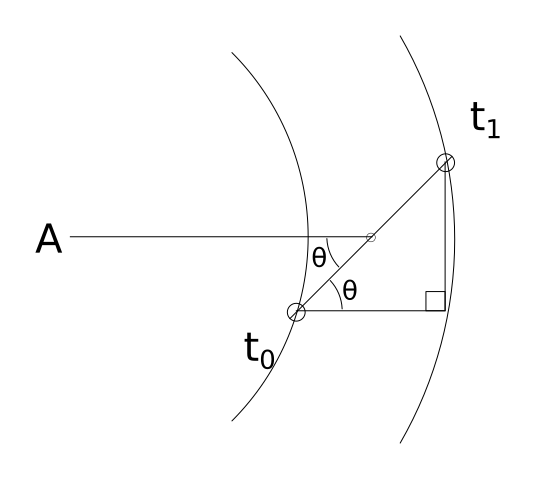 A line that passes through the microphone midpoint, at an angle of θ must, at some point, pass through the sound source. If a third microphone is added, we can repeat this whole process one more time with a different pair of microphones giving a second line pointing to the sound source. The point where these lines intersect is the location of the sound source. See below diagram. How does one turn the theory above into a working implementation? 3x USB microphones mounted in an equilateral triangle configuration, connected to a computer (such as a raspberry pi) for signal processing. The software must monitor the signal from each microphone continually in 3μs rolling windows to attain 1mm resolution. This is not 1mm of accuracy to the source, but 1mm of accuracy for determining the distance the sound wave travels between the two microphones. 3μs gets 1mm resolution. The greater the distance the microphones are mounted apart, the greater resolution one can obtain. If the sensors are mounted 300mm apart, that means about 0.6 degrees of radial resolution. At 3μs and sensors mounted 300mm apart, the sonar system can produce an angles from 0-180 in 0.6 degree increments. A Fourier Transform is performed on each signal to isolate sounds and help connect each signal uniquely. The Fourier transforms allows signals below a certain amplitude to be ignored as well. A simplified algorithm may work–one that only uses an amplitude threshold. The math is pretty easy. Assuming we are using signed doubles, just take the average of the absolute value of each sample within the rolling sample window. Pretty standard sample rate is 44100hz. (44100hz)^-1 is 22.7μs. If we keep a sensor distance of 300mm, we can, at best detect distance in 9.9mm chunks. 9.9mm / 300mm * 180° = 5.9°. So we would have an arc resolution of 5.9°. Call it 6°. That's not great, but for a screwing around project that only costs about $30 worth of hardware it may be good enough. Once we have determined theta for two pairs of microphones, we need to find where the lines intersect. Let x1,y1 be the first midpoint and x2,y2 be the second midpoint. 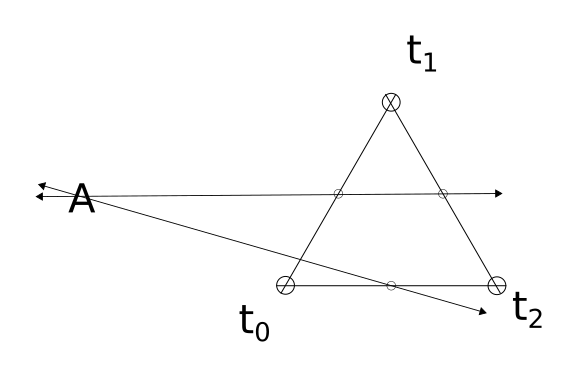 Assume the microphones are in an equilateral triangle configuration, the triangle's center of area is the origin point (0,0). The top most microphone is on the y-axis. The sound source is located at (xs,ys). b1 is the y-intercept for the first line. b2 is the y-intercept for the second line. tan(θ) will give the slope of a line, relative to the x-axis. However, when θ is determined, it is relative to the line formed by a pair of microphones. Thus, depending on which pair we are dealing with, θ must be adjusted. If it is the bottom pair of microphones, no adjustment is needed. If it is the left and top pair, use θ + 60. If it is the top and right pair, use θ - 60. Assume from here forward, θ? means an appropriately adjusted θ.
ys can be determined by substituting xs back into either of the previous equations. Some very rough, very ugly, probably non-functional code. This assumes a lot. But is based on everything written above this. Will test and update once I get some hardware. Once I verify the code works (or rather, once I test it and fix all the bugs I find) I'll restructure the code out into more manageable functions. #define pi 3.14159265358979323 // ... pi. Like the constant, y'know? "Default Low Input Latency: %f\n"